There is an important discussion taking place on the X11 users list regarding the support of indirect GLX (iGLX) in XQuartz. 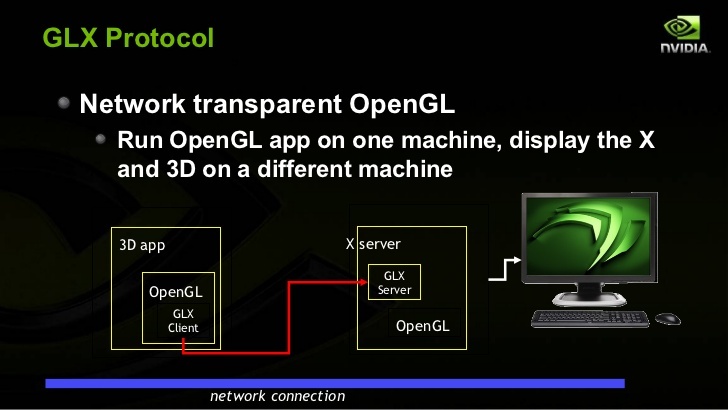 Indirect GLX is an extension offered by X11 that enables the transmission of OpenGL commands from an X11 client on a remote machine to an X11 server on your desktop over the network. For example, when your OpenGL science application running on a remote host tries to draw images using OpenGL and display on your local XOrg (XQuartz) desktop, IGLX (red line below) is used to send the commands to your local X server, which then uses OpenGL locally to draw the commands. In seems in the latest version of XQuartz (2.7.9) this is turned off by default and there appears to be a move to deprecate this protocol. This seems to have been prompted by security concerns but I know nothing of the details. However many scientific applications use this capability and it seems there is no alternative. If this is likely to be an issue for you I suggest you subscribe to the X11 list and make your views known.